Four prominent figures who have been involved with the progress of St. Andrews Hospital since its inception in 1918 are seen following ceremonies to open the new James Playfair wing at the hospital Wednesday night. R. J. Pinchin, president of the board, Mrs. Emma Baker, superintendent for some 30 years and after whom a wing has been named; Stuart Playfair who unveiled a plaque honouring the contributions of his brother the late James Playfair, donor of the original building. Another plaque was unveiled honouring the services of Dr. J. Ross Parrott, right, and his associates, who did much of the planning for the new building opened last year. 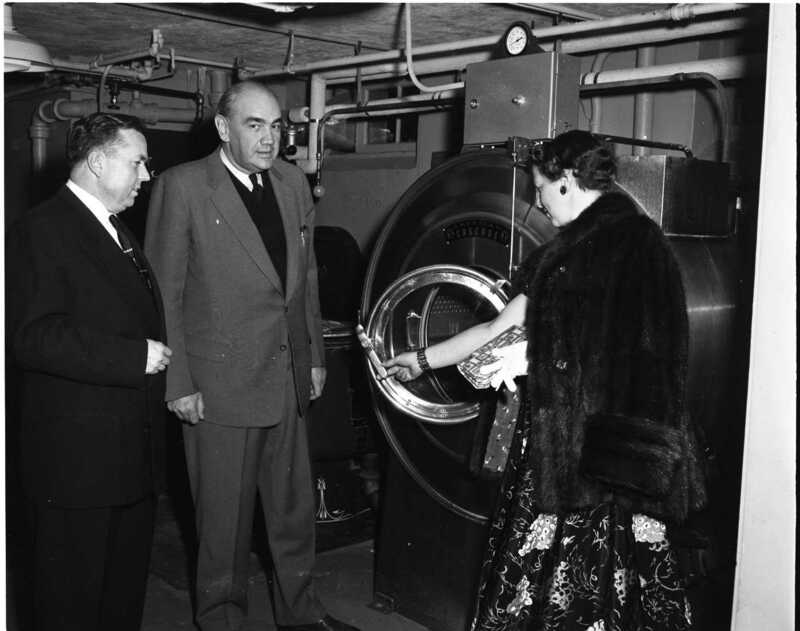 New laundry facilities at St. Andrews are examined by John Burke, building committee chairman, W. A. Robinson, M.P., and former nurse, Mrs. John Burke. 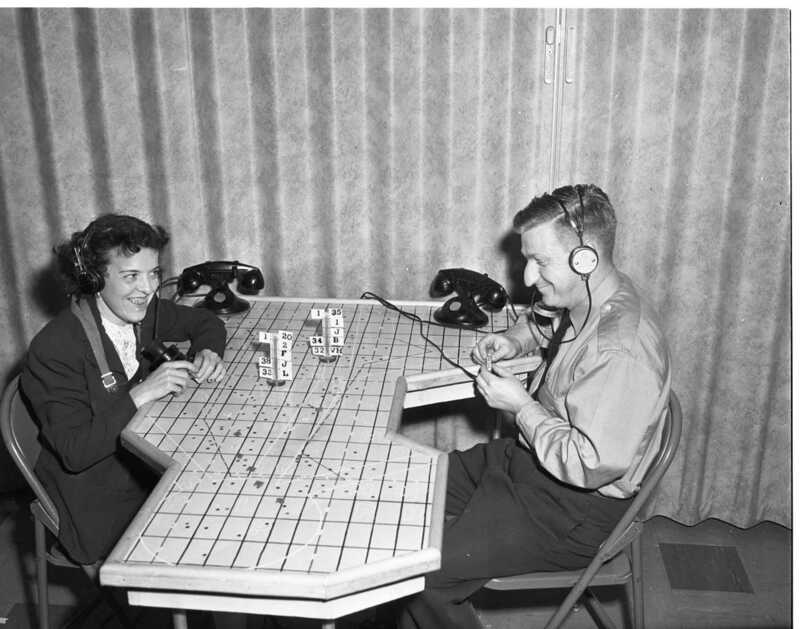 Ground Observer Corps members Mrs. Don Tuttle and chief observer Alf Tuttle are proud of their new table for plotting aircraft flights over the area. Mr. Tuttle made it himself and it is an exact replica of the one used at the RCAF filter center in Barrie. The fifteen member group report that 48 sighting calls were made to the filter center last month, the largest since the group started. 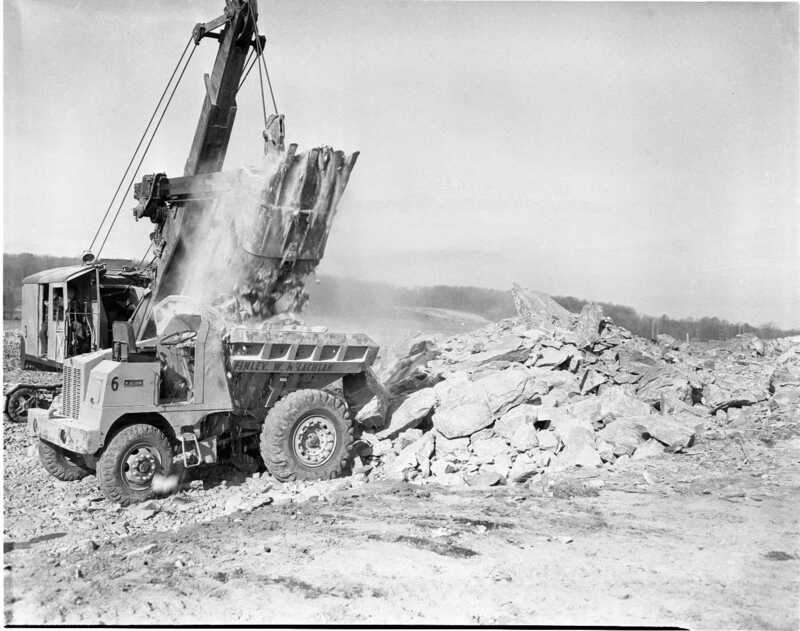 Laying the section of the new Trans Canada Highway that runs from Waubaushene to Port Severn is a job that requires big machinery and big material. These large slabs of rock provide excellent fill for the many marshy areas. Over 300 delegates attend the annual meeting of District 8, Ontario Secondary School Teacher’s Federation held at MPDHS on Friday. 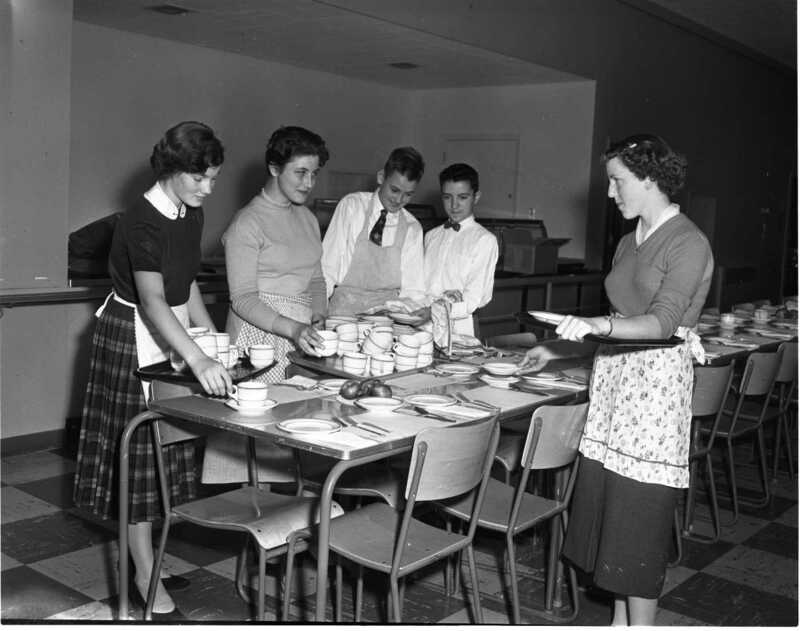 Students helping in the cafeteria to feed all the guests are, Karen Wilcox, Robin Benson, Gerry Geere, Allan Kirkup and Shirley Foster. More than seventeen members of the Georgian Bay Hunters and Anglers were present at a building bee last weekend at the clubs new site back of the Martyr’s Shrine. Studying plans are president Bill Russell, Jim Duncan and Lloyd Wilson. Forty years of service as a volunteer fireman on Midland’s fire brigade was honoured Thursday night at the Parkside Inn. 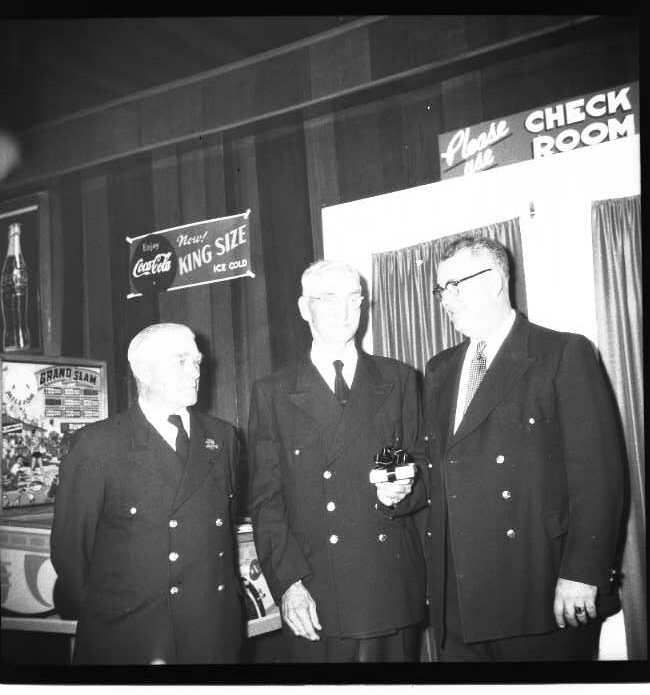 Henry Woods, 2nd Liet., watches as Bill Crawford, center, is presented with a wallet and money by Jack Argue, chairman of the fireman’s finance committee. 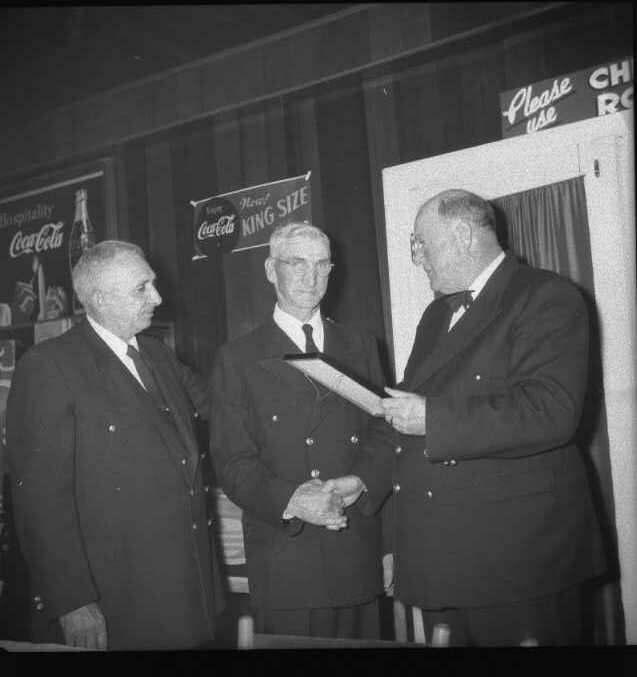 In the bottom photo Earl Allsopp, secretary and 1st Lieut., on the left, and Dalton Jennett, captain, on the right, join in on congratulating Bill Crawford and presenting him a certificate. 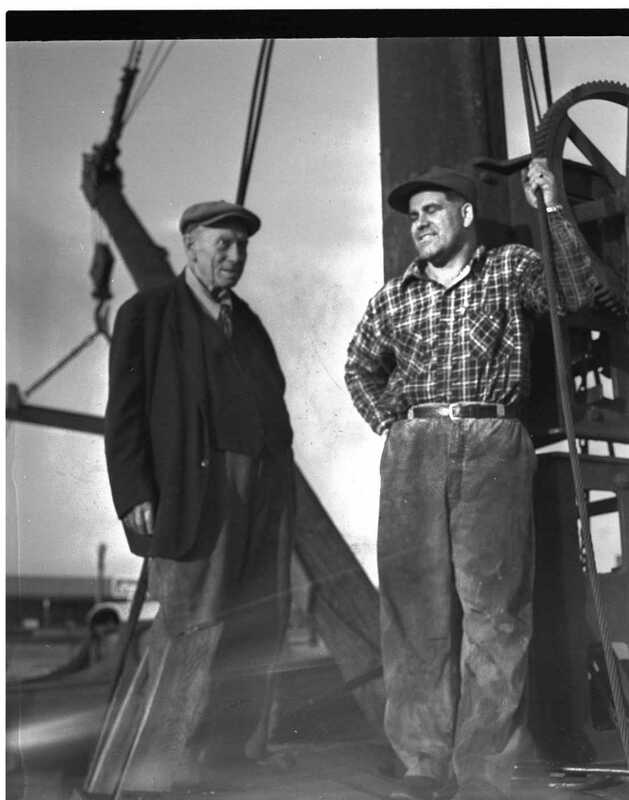 S. C. “Bert” Hanly hands over his waterfront crane to Midland Machine Shop operator Lloyd Atkinson, who has purchased the historic equipment from its long-time owner and operator. 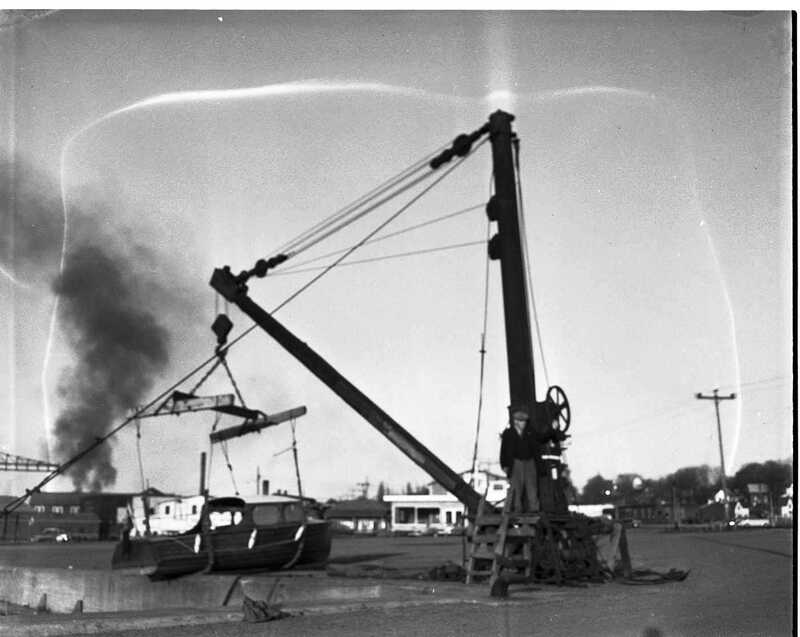 Bert built the hand operated crane about 1917 at a cost of $1,100.00 but previous to that had performed the same function from an oak bottomed scow equipped with two cranes. There was no set fee, the charge was estimated by the “bigness” of the craft, beam and draft being as variable as length. He averaged about 300 boats per year. Tomorrow he sets off on the annual deer hunt, a tradition since 1896. Bert is 83. Delegates to a boys’ rally, sponsored jointly by the Boys’ Work Board and the Christian Education Committee of Simcoe Presbytery of the United Church, register at St. Paul’s United Church, Midland. The rally Saturday afternoon featured games, stunts by the boys and their leaders, talks and films. Major damage in the fire at St. Mary’s Separate School early Friday morning occurred in the class room which was occupied by grades 5 and 6. The room was completely destroyed. 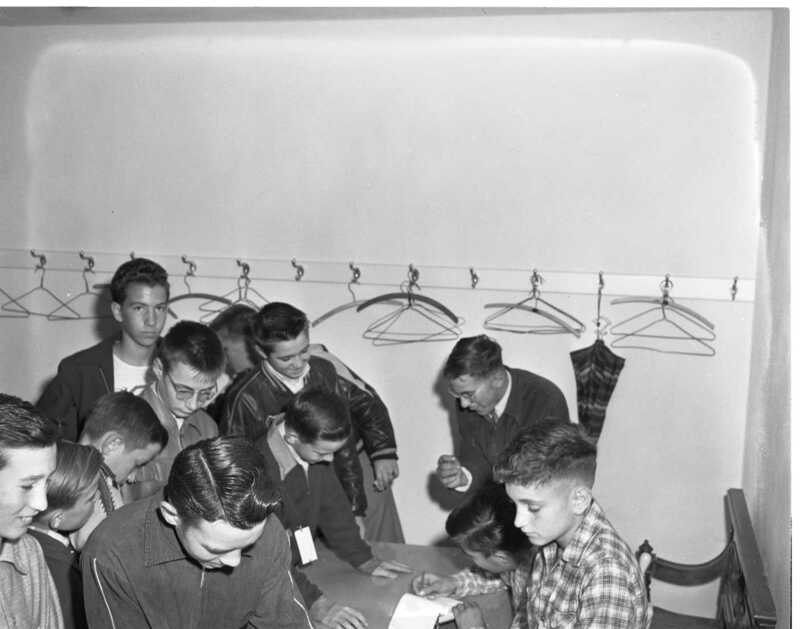 The students have been accommodated in surplus rooms at Parkview and Sixth Street schools. 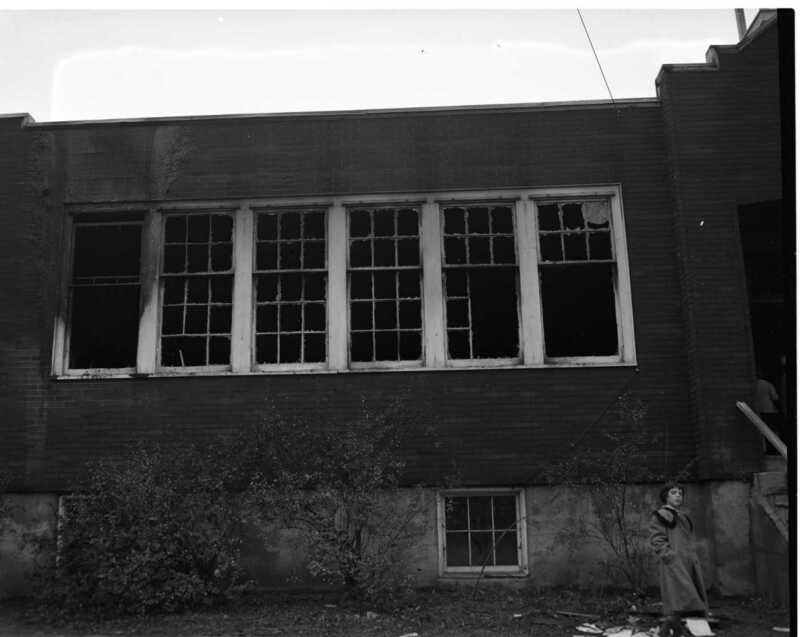 Four other class rooms were badly damaged by smoke and water. Wendy Howard of the MPDHS junior girls volleyball team gets ready for a smashing serve over the net at the high school tournament Saturday morning. Orillia won top place of the four teams entered. In a letter to the editor a local group seeking liquor outlets in town has turned down any request for beverage rooms, their objective is to have a liquor and beer store only in Midland. They also want organizations to be able to obtain a liquor license for special events so that groups would be less likely to take events outside of Midland. The first two of the Ontario government’s historic site markers were unveiled last week in Toronto. Midland’s W. H. “Bill” Cranston, chairman of the Ontario Archaeological and Historic Sites Board opened the ceremonies with remarks. Premier Frost paid tribute to Midlander J. H. “Herbert” Cranston whom he described as a “great Canadian” in pioneering the preservation of the province’s historical heritage. Every week there is a “gossip column” in the paper called “Did You Hear, The Midland Social Week”. The Penetang column is called “On Dit”. In the County Herald, November 2nd we learn that Mr. & Mrs. Nap Laurendeau will leave Malton by plane Saturday to fly to Winnipeg for a few days. 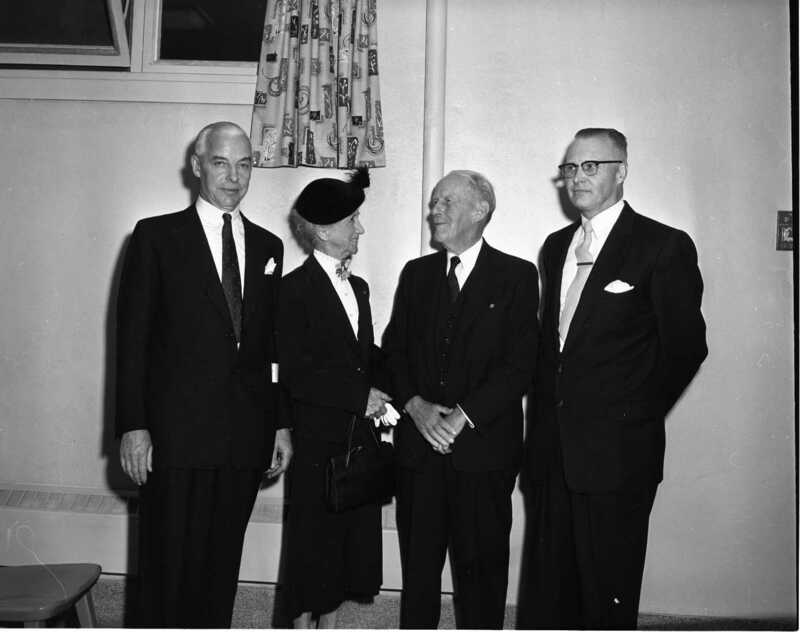 — Mrs. Charles Hardy entertained members of Lady Parkhill Lodge, LOBA (Lodges of the Ladies Orange Benevolent Association) after their meeting of October 19. — Miss Marion Evans, to be married to Arthur Argue tomorrow at Knox Church, has been the guest of honour at several miscellaneous showers. On Oct. 25, thirty five friends and neighbours were present at the home of Mrs. F. E. Lowes, Fifth Street, which had been decorated with pink and white streamers. The previous Monday, 25 employees of Wagg’s Laundry gathered at the home of Mrs. Roy McConnell. — Miss Pat Perrin will be in Toronto until the end of this month. She is working and studying florist work in the shop of Eunice Denby. — Mrs. Jack White, Mrs. Flora Banting and Mrs. Edward Jeffery Sr. are leaving Tuesday morning for the south. They will spend the next six months in St. Petersburg, Fla. — Miss Joan MacEachern, daughter of Mr. & Mrs. Donald MacEachern, who is a nurse in training at the Royal Victoria Hospital in Barrie, visited her parents Sunday, prior to leaving for Toronto where she will spend three months affiliation training at the Hospital for Sick Children. Cinema usherette in the dentist chair when asked which tooth was giving her trouble replied, “Second from the left in the balcony” —– “I don’t like the look of your husband” said the doctor gravely. “Neither do I” the wife replied “but he’s kind to the children.” These little bits of humour, used as space fillers are found in most of the Free Press and County Herald papers. Singer Sewing Center, machines rented by the week or by the month. 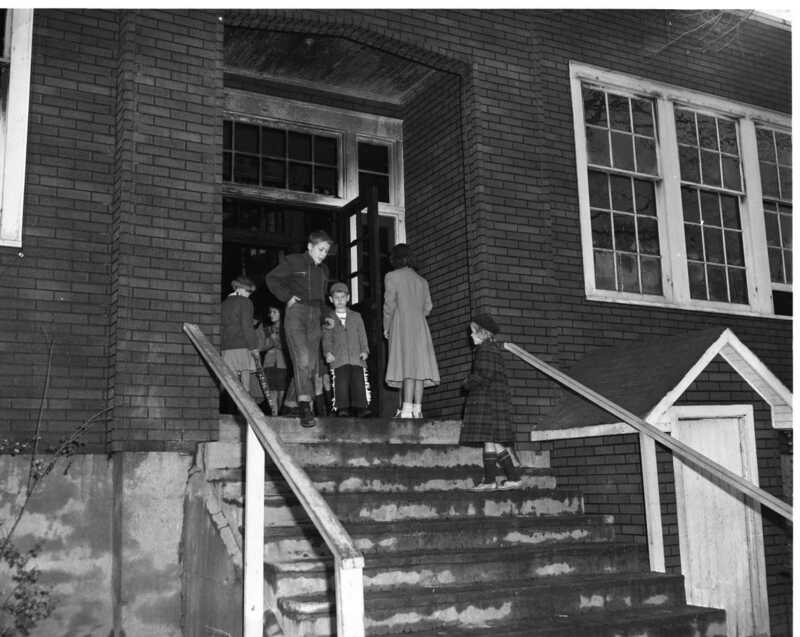 In the PMCS News column, Judy Quesnelle reported that an election was held on Oct 8th to elect new officers for the Port McNicoll Continuation School for 1957. 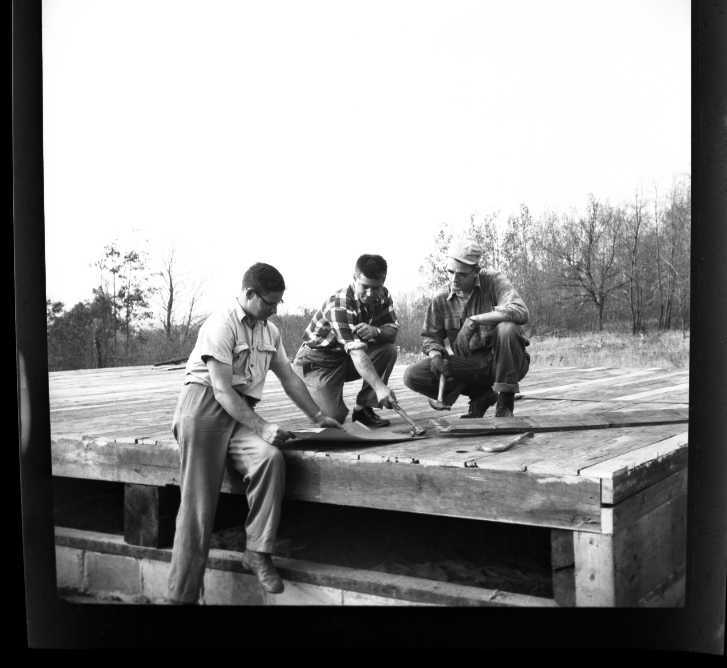 Alfred Simon, a twenty year old roofer from Toronto, died in Penetang hospital from injuries received when he fell from the roof of the new Simcoe County Home for the Aged in Penetang. A lifetime spent in the lumber business came to an end Monday when Marcel Tessier died following a heart attack. Owner of Tessier Planing Mill in Penetang, which he has managed since the death of his father 25 years ago. The only other sibling, Father Phillip Tessier is returning from Brooks Alberta to attend the funeral. Established in Orangeville 36 years ago by A. J. Grigg, the Grigg Company will open a new branch store in Midland Friday. Termed a junior department store, the new addition to Midland’s downtown will be located in the building formerly occupied by Loblaws Limited. Thirty-eight teams in Midland and Penetang have been organized for Little League and Midget hockey this year. 25 YEARS AGO THIS WEEK — Fire of unknown origin destroyed a boat storage building owned by Gidley Boat Company of Penetang. Thirty-three boats including several launches stored for the winter were lost. Damaged was estimated at $50,000.00. — A football tournament at Beck’s field in Penetang went on despite heavy rain that made the field a sea of mud. Both Midland’s junior and senior teams were defeated by Orillia, but Penetang juniors carried home town honours by defeating Balmy Beach 3-0. Some of the Penetang players were, Trilsbeck, Don & Ed Copeland, O’Hearn, Crippen, Grise and Quigley. 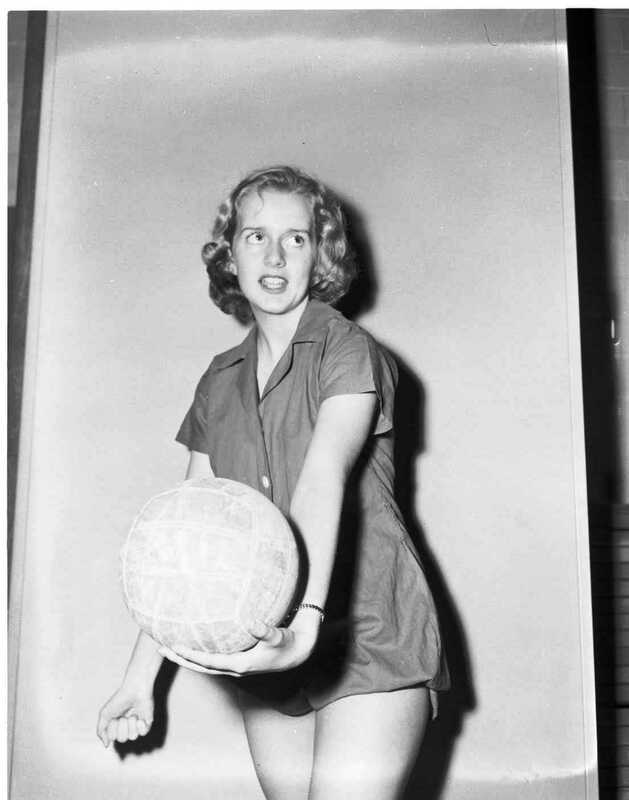 Penetang juniors were Ontario semi-finalists in 1930. — Three adjacent cottages in Waubaushene that had just been completed in the summer, were destroyed by fire. The cottages were owned by Toronto residents and had been vacated for the winter. — Exactly one year after the Ontario Cafe and adjoining beauty parlour were destroyed in an early morning fire, flames devoured a two-story frame building on Bay St. near the Canadian Department Store. 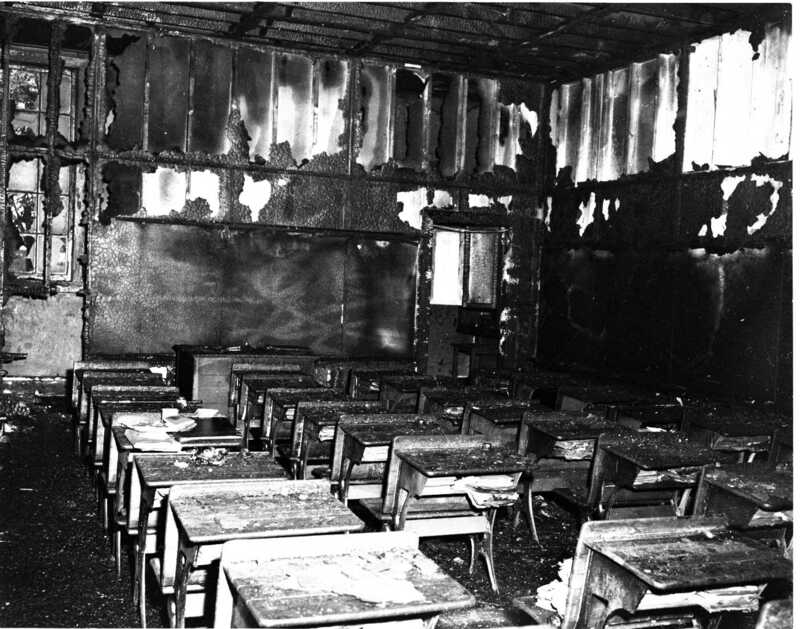 The blaze was discovered by a Mr. Byrne, who also discovered the fire the year previously. [Is that a coincidence or is his name an even bigger coincidence.] — Nine helpless inmates of the Ontario Hospital in Penetang died when a men’s sleeping cottage was destroyed by fire. The cabin destroyed housed aged cripples, who could do little to help themselves. In 1911 the Roman Catholics of Midland had no church or meeting place large enough for their growing congregation to celebrate Mass. Father Laboreau of Penetanguishene was the priest in charge of a large parish that extended to the Coldwater area. The Reeve of Midland at the time and Master of the Orange Lodge, Lorenzo MacFarlane, offered Father Laboreau the Orange Hall for services. After overcoming his surprise Father Laboureau accepted the offer. Fire destroyed a 30 by 14 foot boathouse on Picnic Island owned by Cecil Shaw of Welland. Two sixteen foot boats and a canoe were lost in the blaze. One was the first of its type built by Alfred H. Gidley of Penetang and the other was the last boat built by Mr. Gidley, who is Mrs. Shaw’s father. Midland Brass Band requires boys 10 years old and up, instruments available.